With less than a month for the most-anticipated Marvel movies of the year, Avengers: Endgame, to release, the anticipation and excitement are whirling to the ninth cloud. While the fans cannot hold back their inquisitiveness for what MCU has in store for them, the posters of the film has everyone’s interest wrapped around Avengers: Endgame. The internet is currently flooded with Avengers: Endgame character posters as the makers prep a month before the big finale of the Avengers franchise hits the theatres. Now, the cybernauts have taken this opportunity to pay tributes to other ‘fallen’ figures in pop culture. Avengers: Endgame New Character Posters Reveal Who Survived Thanos' Snap and Who Didn't - View Pics! The latest posters of Avengers: Endgame prompted Twitterati to bring out their creative side, as they took this game beyond the Marvel Cinematic Universe. 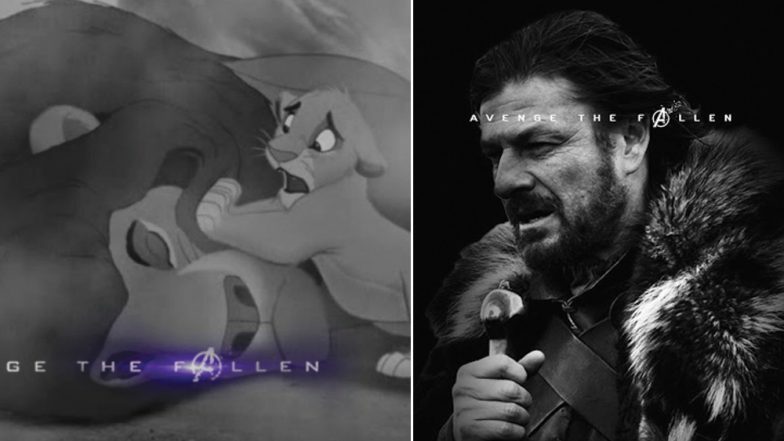 From Mufasa to Ned Stark, everyone gets one big tribute from the netizens, as they “avenge the fallen”. The new posters released by Marvel are divided into colour and monochromes suggesting the members who survived Thanos' world-ending snap and those who didn't. The Black and White posters feature those superheroes whom we saw getting decimated in the last film. The coloured ones are of those who are still surviving and will fight back again. Avengers: Endgame: A R Rahman All Set To Compose an Anthem for Indian Marvel Fans - More Deets Inside! The posters have definitely stirred up a lot of emotions among fans, especially looking at the Black and White ones featuring the superheroes who were seen being decimated in the last film. Avengers: Endgame is all set to hit the theaters on April 26th.